Season pork with salt and ½ of the pepper. In a cast iron pan, heat 3 tbsp oil over medium high heat. Fry pork ribs and pork shoulders in batches, turning once or twice, for about 5-8 mins until golden brown. Drain fried pork on a wire rack. Leave 2 tbsp of the oil used to frying the pork earlier in the pan. Discard the rest. Add in shallots and stir fry over medium heat until softened. Put in garlic, chillies and ginger and stir fry for another 3 mins. Dish out the shallots mixture into a large clay pot and add in the fried pork. Mix in the remaining ½ tsp pepper. Pour in caramel sauce, stock and coconut water. The liquid should almost, but not completely, cover the meat. Add more water if needed. Over medium heat, boil the stock and then bring down to a simmer. Cover with lid and cook at a vigorous simmer for 45 mins. Meat should be tender but not falling off the bones. Add in hard-boiled eggs and put on the lid again. Cook for another 5 mins until the eggs absorb some of the colour and flavour from the sauce. 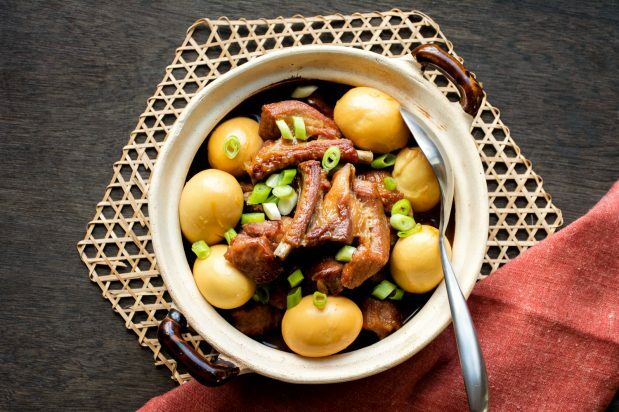 Serve directly from the clay pot with steamed rice. In a sauce pan over medium low heat, slowly melt the sugar while stirring often. The process should take about 10-12 mins. Do not rush the process as you may burn the sugar. Once the sugar turns into liquid and without any lumps, remove the pan from the heat just as when the liquid starts to boil. Slowly add in the fish sauce while stirring frequently. Be cautious as the liquid is hot and may bubble. The sauce can be used immediately or once cooled, can be stored in an airtight container inside a cool cupboard for up to 3 months.